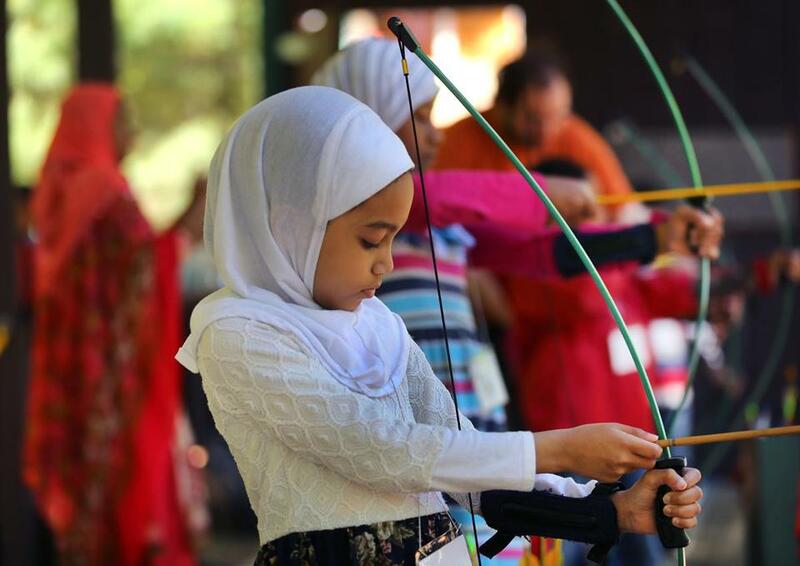 Tawhida Khaifan, 6, loaded an arrow onto her bow during an archery lesson Saturday as part of Islamic Day activities at New England Base Camp, a center for Boy Scouts and Girl Scouts in Milton. MILTON — Dozens of children navigated the ropes courses, chucked tomahawks at targets, and cheered as they shot bows and arrows for the first time. The Boy and Girl Scouts had begun their Saturday morning activities at the New England Base Camp by raising the American flag and reciting the Boy Scouts’ Oath and Law. And then they finished with a Muslim prayer. Scouting is for everyone, said Chuck Eaton, executive director of the Boy Scouts Spirit of Adventure Council, which oversees troops in Boston and the northeastern Massachusetts region. Eaton said there has recently been an increase in interest from Muslim families in the region’s Boy Scouts programs, although no figures were immediately available. Eaton said the rise in participation was substantial enough for the local Boy Scouts council — the largest in Massachusetts — to host an Islamic Day. “We’re excited about it,” said Eaton, as children shouted and laughed in the woods of New England Base Camp, an 8,000-acre space in the Blue Hills Reservation operated by the council. 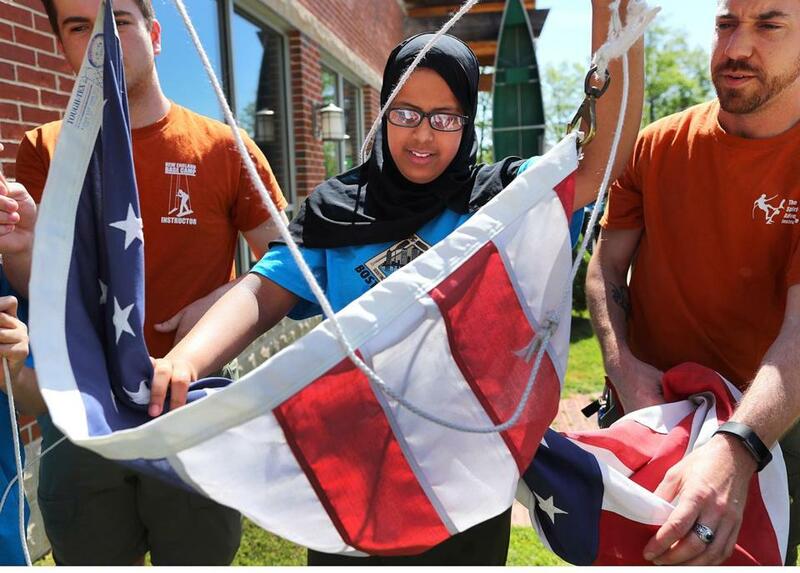 Wafaa Wahabi, youth director for the American Islamic Center in Everett, said the Islamic community’s engagement in Boy Scouts is one of the many interfaith initiatives they are pursuing during a tumultuous political period. The Islamic community’s interest in the Boy Scouts follows a tumultuous election that featured controversial rhetoric about Islam, as well as President Trump’s efforts to implement a travel ban from several predominantly Muslim countries. Although the number of hate crimes declined in Boston last year, a nationwide study shows they have surged in other cities. The Islamic Academy for Peace has had Scouts troops for about a year, according to principal Jameelah Shareef, and Eaton said Muslim parents have expressed interested in starting a troop in Everett as well. WickedLocal reported that a Muslim Girl Scouts troop in Malden began meeting last October. A Muslim Girl Scouts troop in Quincy has existed for years. 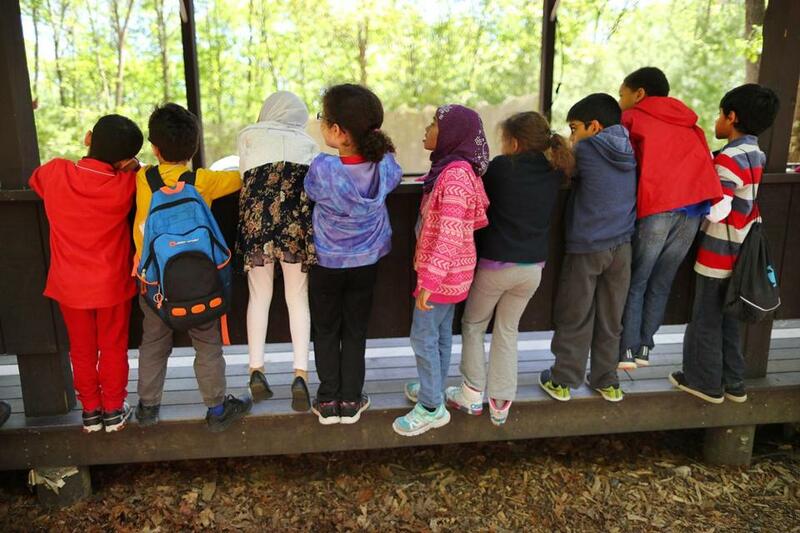 Youngsters from the Islamic Academy for Peace in Methuen stood at a railing to watch a lesson in archery at the Scouts’ New England Base Camp facility in Milton. Shareef recalled fondly an overnight camp she attended as a young child. Her students ought to have similarly memorable experiences, she said, as her 9-year-old daughter peered over a railing to watch a bow-and-arrow lesson. Ahmadou Balde, a 25-year-old development executive for the Boy Scouts Spirit of Adventure Council, said he wasn’t a Scout during his childhood but loves the Boy Scouts’ commitment to youth development across all cultures. The children understand the feeling of stigma even if they don’t grasp the nuances of why it is occurring, according to Balde and parents. Indeed, Eaton said he has learned a great deal about Islam since the Islamic Academy for Peace began its Cub Scouts pack. He hopes that as young Muslims interact with the many other children at the camp, knowledge of the Islamic faith can grow. The Boy Scouts Spirit of Adventure Council wants the Muslim families to know that their faith is welcome, he said. For example, Boy Scout traditions include a nondenominational “moment of reverence,” which was shifted Saturday to the Islamic prayer led by Abubakr Fakhry, youth director of the Islamic Society of Boston Cultural Center in Roxbury. The New England Base Camp also set up prayer rugs by a trail in the woods for Muslims to easily break from activities for worship. The Islamic Day at New England Base Camp also featured an educational program intended to inspire respect and understanding of Islam. Topics included prayer, reasons for fasting during Ramadan, and personal stories from Muslims, according to a statement from the Boy Scouts Spirit of Adventure Council. Creating bonds across differing communities is “literally the subtle [mission] behind the creation of Scouting,” said Eaton. Narman Shiaypi, 12, of Chelsea raised a flag during the opening ceremony with the help of Chuck Blanchette.